Most of us tend to ignore skin toners but trust me, skin toners are as good and essential as your cleansers are. 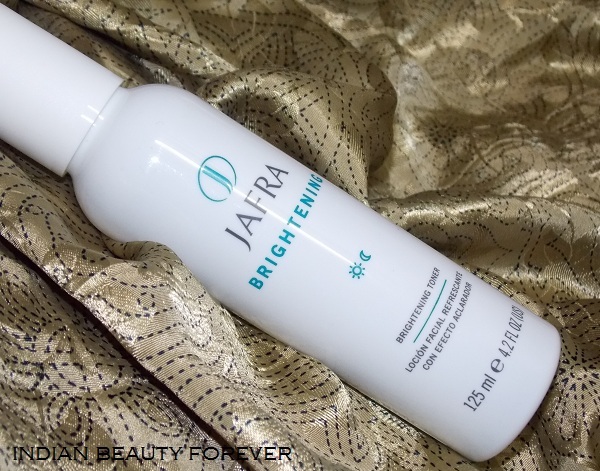 I will review Jafra Brightening Toner today. If you aren’t aware or are a new reader then let me tell you. 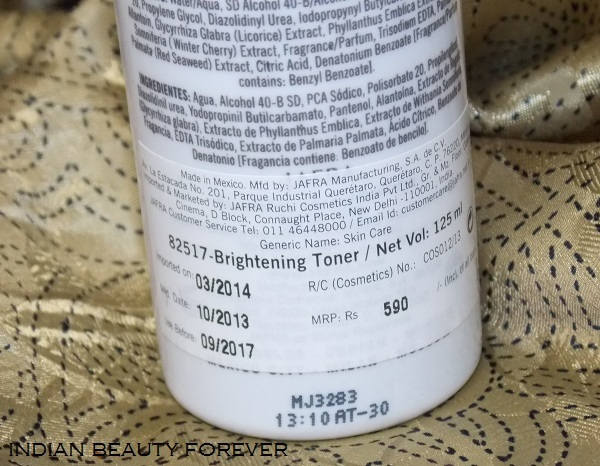 I have received the entire Jafra brightening range of products while I was at the Jafra blogger’s pamper party and this toner along with the day brightener was my crush that day! Reason was pretty clear, its refreshing jasmine fragrance. Price: 590 Rupees for 125 ml. How to use: Use Jafra Brightening Toner morning and night after cleansing, Sweep on with a cotton pad over face and throat. Follow with brightener and/or moisturiser. Clinically allergy, irritantancy and dermatologist tested. The brightening toner is packaging as a white bottle that is easy, travel friendly and hygienic to use. The bottle is very sturdy. The toner actually feel like a Jasmine infused scented water. Once apply with a cotton pad it doesn’t sting my face and has a slight cooling effect. I find this toner to be decently hydrating to certain extent as while I was battling with bad skin and some rough patches. It has actually taken care of the dryness around the jawline and the rough patches weren’t as rough. After applying this, my skin looks dewy but not shiny. I would wait for a couple of minutes for it to fully get absorbed before proceeding with the moisturiser or the day brightener. I haven’t noticed anything significant for my pores. I have a couple of pores on the tip of my nose, which is also the oiliest part of my face but the pores were as it is, No shrinkage, Nothing! But the skin feels better as in no dryness or oiliness just a soft glow and dewiness. I don’t think it will be heavy or unsuitable for very oily skin even. If you’ll see the ingredients list, the list of the ingredients isn’t much as compared with some of the other products. It hasn’t irritated my skin. Moreover, I used it when my skin was not behaving properly. My skin was oily and dry at the same time which made me really difficult to tackle my skin. Whenever something like that happens I make sure that I use toners religiously.yeah, even i tend to ignore them, that's why I said "most of us" in the first line. Anyways, Now, the brightening thing. Yes, over the time skin looks brighter and this is not just due to this product alone but the collaborated result of the other products from the brightening range that I am using as I know what havoc that illness has played on my skin. 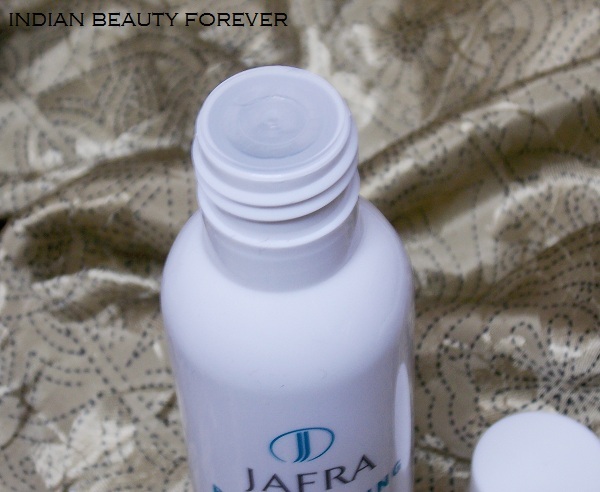 Take: Jafra Brightening Toner with its watery feel and jasmine flower scent/ extracts is suitable for all the skin types. It makes the skin looks dewy and removes the oils/dryness, maintaining the skin's pH balance though won’t control oil since it is just the toner. It won’t do anything for the large pores so don’t expect for the same. Other than that it is a good toner to include in the skin care regimen if you’re looking for a change. The bottle will last for more than a month even after using day and night, but still we wish price could have been cheaper but that totally depends on you. In short it is a good product to try.